Only when writing this I realise I’ve never reviewed Spicebomb before! Which is weird as I’ve been wearing Spicebomb Extreme religiously since Christmas. But better late than never. Spicebomb, an incredibly well performing male fragrance – that relies on being genuinely gorgeous rather than pure marketing – and just in time for Father’s Day 2016 (by the skin of their teeth) have launched Spicebomb Barbershop. N.B. It has been raised that there might be a double standard in talking about Azzaro’s latest fragrance v.s Spicebomb. 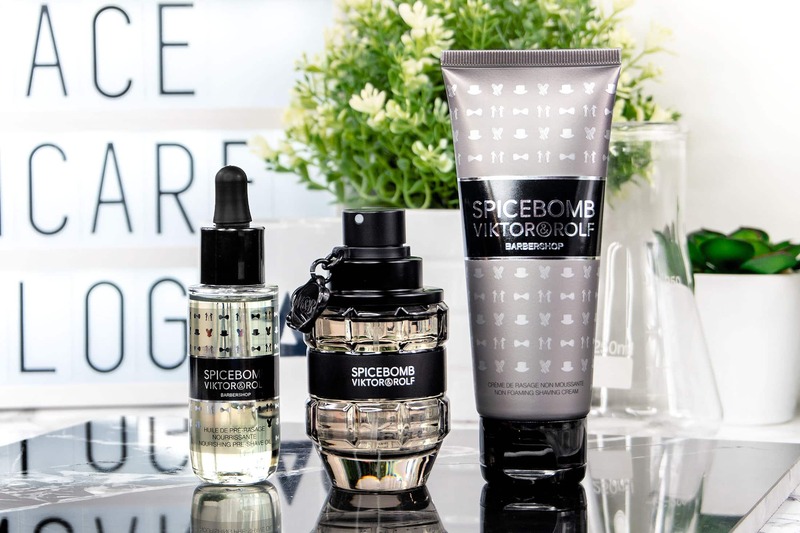 Spicebomb is a flanker of Flowerbomb from 2005, now an 11 year old fragrance bottle and wasn’t specifically designed to pander to male markets with it’s grenade shape; rather than a brand-new fragrance in the shape of something we hear killing people on a weekly basis. I’m not judging older products by today’s standards – just as I continue to use Grenade sports supplements. Spicebomb launched in 2012 and is a woody spicy fragrance with most noticeable notes of cinammon, pink pepper, tobacco, saffron and leather. It’s very masculine but has a perfect harmony of sweet, spice, and citrus-floral. Spicebomb is a triple threat! The Spicebomb Barbershop products currently stand at a Non-Foraming Shaving Cream and, which I had to take a double look at, the pre-shave and nourishing oil. Both products are fragranced with Spicebomb original fragrance. I assumed the oil was a beard oil, but the whole ethos behind the launch is being clean, clean shaven and smelling fresh. So, the oil is a preshave oil to lubricate and nourish the skin and can be used to hydrate the shaved areas afterwards. The Pre-shave oil can be used as a beard oil too! VIKTOR & ROLF Spicebomb pre shave oil 30ml. £25. Selfridges. The Non-Foaming Shaving Cream also has that incredible Spicebomb power behind it. Unfortunately I’m not in love with the ingredients, of which the highest concentrates include mineral oil and palm oil, BUT, this product is designed to be applied and almost immediately washed off and these two ingredients do very well at creating a barrier on the skin to protect against your blade. VIKTOR & ROLF. Spicebomb barbershop non-foaming shave cream. £20. Selfridges. The Spicebomb Barbershop Non-Foaming Shaving Cream (£20) and Pre-Shave Oil (£25) are both available exclusively from Selfridges. This article first appeared on MANFACE written by Thom Watson. It was published on Friday 17th June 2016 and was last updated on Monday 3rd April 2017 at 12:53pm. It's categorised under Viktor & Rolf, Woody Fragrance where you'll find more related content. Has anyone still got the kiehls roller ball in the pour homm scent I had several of these many years ago as the por homm is their greatest smell ever. The roller balls are a couple inch high but kiehls won’t re realese it again. So if anyone has any I will happily purchase as many as I can get unless a certain mens beauty blogger can get kiehls to bring these back? Hold up, you have a problem with a revolver shapped bottle of aftershave and declare you won’t be working with such brands that do this kind of marketing …….. then 5 days later you put up a big picture of a hand Grenade front and centre and talk about how you love it?? This despite the fact you are promoting the oil and shave gel…….. I understand that it’s the fragrance your saying you love (I’m also a fan) but it really is mixed messages here. I figured a couple of things differ with Spicebomb. The product launched in 2012 and is a flanker of the women’s from 2005, so by this point it’s an 11 year old bottle – this wasn’t released in its shape in order to pander to a men’s market as Azzaro was, it was a ‘women’s’ product first. My point with the Azzaro was that it was a brand new product, released in a time where every other day we’re hearing how guns killed people in one city or another, particularly last weekend.